The path out of St Margaret’s Bay rises steeply to Ness Point. The map shows a path which appears to climb the very front of the cliff; but the obvious path to us, who were not studying the map in great detail, was the back road. After five minutes of walking we realised we were not on a particularly scenic route, so cut over a ridge back to the clifftops. My guest-walking uncle sprang over the ridge in what seemed to be a few short bounds, proving himself to be something of a cross between a spring chicken and a mountain goat. How he wore those plus fours with pride! The rest of us gasped our way slowly to the top and collapsed in a heap, staring up in awe at the vision of the unruffled athlete as he towered over us in calm merriment. My aunt brought up the rear, passing the tangle of limbs from our exhausted pile of broken bodies with a raised eyebrow as we fought for breath. She and her husband walked on, leaving us to pick ourselves up and wonder at their fitness. Our exertion was worth it though, and after a short while we had amazing views looking back the way we had come. 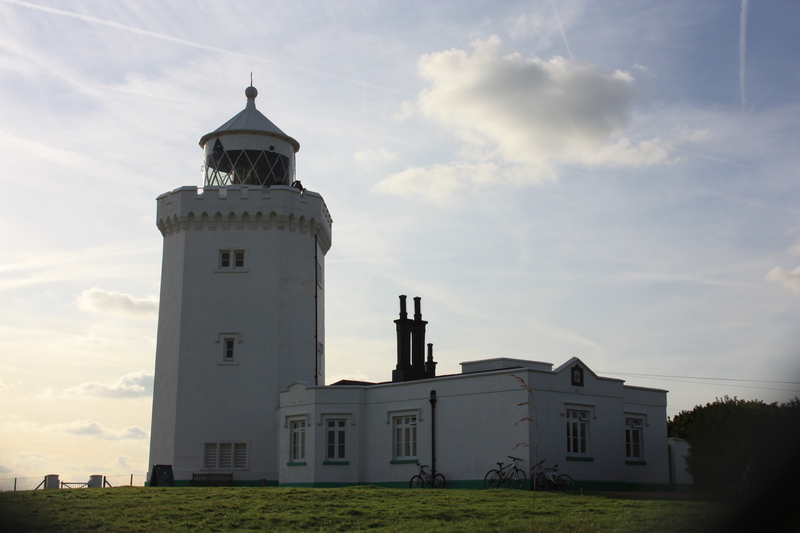 A short distance on, we arrived at South Foreland Lighthouse, a Victorian Lighthouse which was in operation until 1988, and which is now owned by the National Trust. It is a beautiful building, open to the public, although we had no time to visit it today. It was originally built to warn ships off the Godwin Sands, which I have described in a previous post. 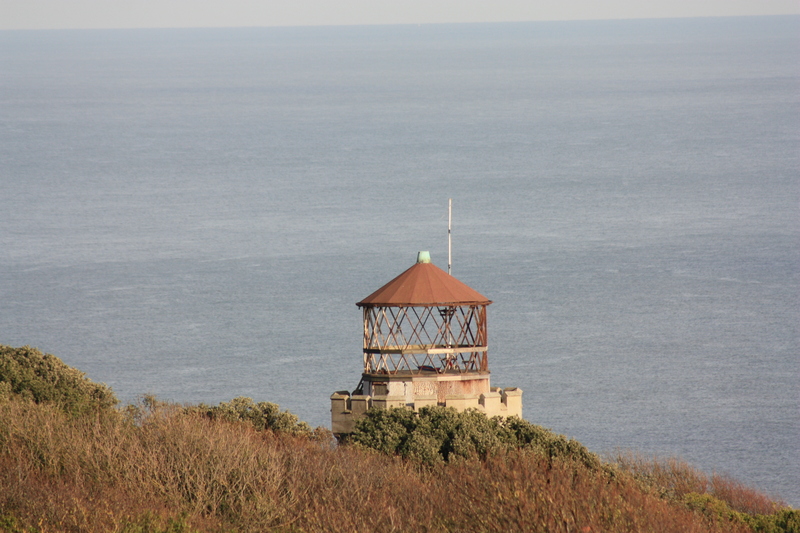 In fact, there had been a previous lighthouse slightly further along the cliffs, its function to mark the point where ships could safely turn away from the Godwin Sands without risk of hitting them. It was built in the 1840’s, but due to the shifting nature of the sands it became increasingly inaccurate to use. It was removed from use in 1910. Today it is part of a private garden, and can just be seen peeking up at its more modern and better kept younger brother. It stands dangerously close to the cliff edge. Leaving the lighthouse behind us, we strode on towards Dover itself. 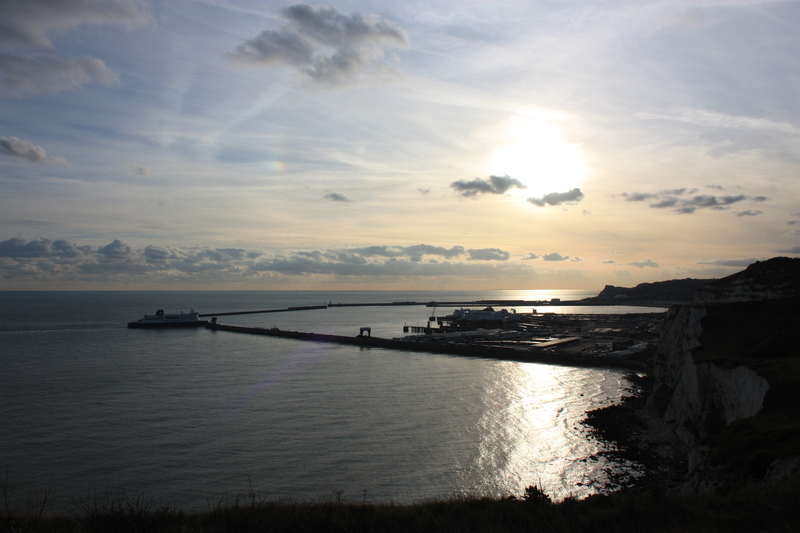 If you have never been to Dover, then I would strongly recommend that you park your car at St Margaret’s and walk over the cliffs for your inaugural visit. This is because as you turn the corner of one of the cliffs the harbour suddenly comes into view. The enormity of it took me completely by surprise. From this direction, the harbour is Dover’s overture, and it is impressive indeed. The cliff path leads over the top before eventually dropping down to the town. 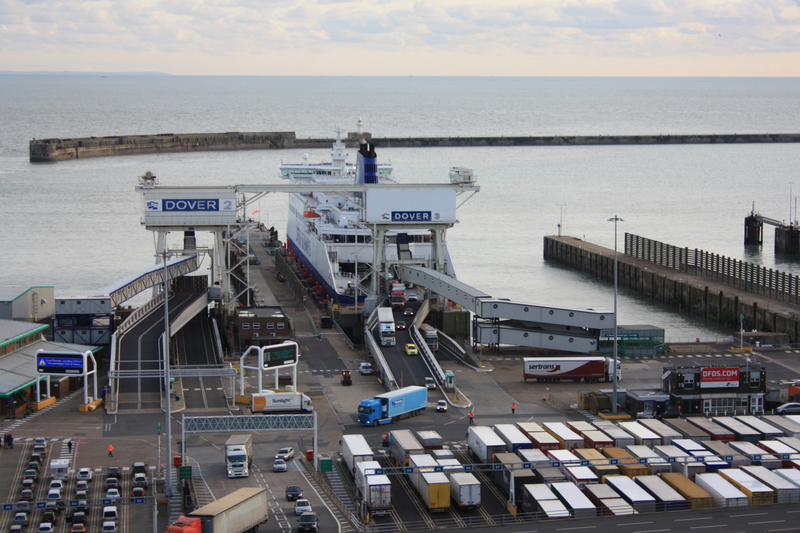 As we walked above the harbour, we saw hundreds upon hundreds of lorries disembarking from the docked ferries, whilst hundreds upon hundreds of others queued up to board. Ships queued out into the Channel, no doubt laden with lorries ready to swarm off them once in port. “Now you know where all the lorries in this country come from,” my uncle remarked. Indeed. It reminded me a little of the scene from Invasion of the Body Snatchers where the pods are offloaded from trucks, to be taken on to infect and infiltrate the entire country. We walked into Dover and ended our walk at the Premier Inn on the seafront. This one walk has taken four posts to describe – there was a huge amount to see. 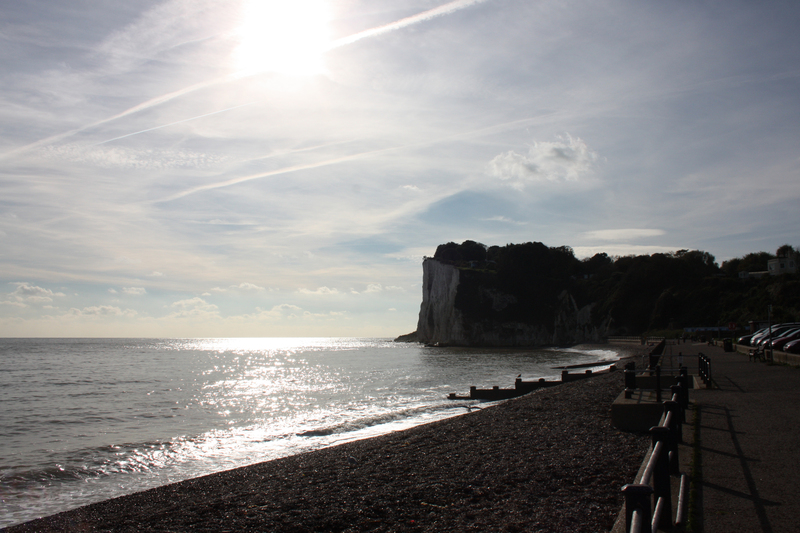 This entry was posted in Kent and tagged coast, Dover, Kent, lighthouse, South Foreland, travel, walking. Bookmark the permalink. Must get out to Dover next time I visit England. It looks marvelous! Thanks for your comment. The way west from Dover is also lovely. The path takes you over the cliffs, then back down where you can walk under them at low tide. Massive chunks of chalk, bigger than you are, litter the sand where they have fallen away from the cliffs above and speared themselves into position. Very few people walk that way. It really is beautiful.